Just a few days ago I had a moment where I was playing The Elder Scrolls V: Skyrim and I had to go out. Like, outside, in real life. Begrudgingly, I quicksaved and went to put my Switch into sleep mode when, suddenly, I realized I could pick it up and take it with me, continue cave spelunking while I was in the passenger seat. Glorious. It’s a simple and obvious thing, everyone with a Switch is well aware of handheld mode, but the way it changes games we’ve played in the past is what’s so fascinating. 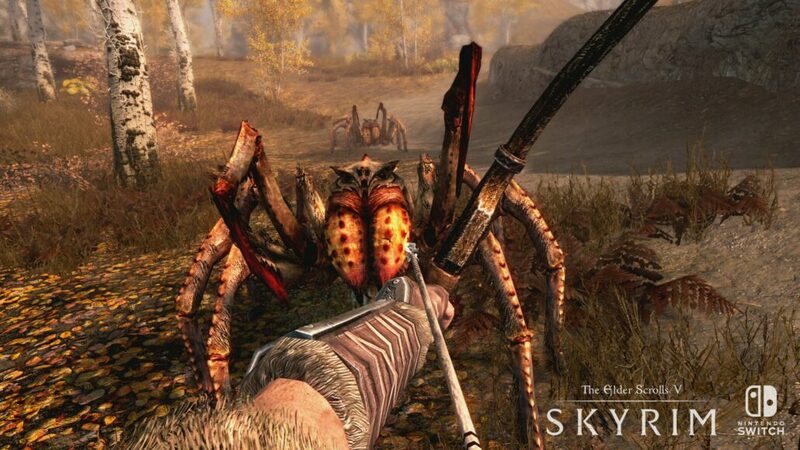 I remember playing Skyrim when it first released, and that initial week – despite being riddled with bugs at the time – was a glorious romp. These days, games like The Witcher 3 absolutely devastate Skyrim’s once advanced world, but that’s not the say the Nordic Highlands are any less enjoyable than they once were. Riding through the world on horseback with my Housecarl Lydia is still loads of fun, even years later. Of course, I can point out Skyrim’s flaws. Quests play out similarly almost all the time, caves and barrows all feel pretty much the same and have the same puzzles – basically, once you’ve played through a handful of each type of cave, bandit hideout or fort, you know what to expect from that point going forward. The only significant change between any of them is, of course, the dialogue, which ranges from hilarious and memorable (The Hangover quest) to entirely forgettable (almost every other quest). But despite those well-known flaws, Skyrim for Nintendo Switch is a game that holds up marvelously; helped by the fact that I came across zero quest-breaking bugs this time around. Not one. There were some minor bugs I saw, I came across a lot of random dead bandits and animals, even a dead giant placed right outside the gates of Whiterun with what looked to be a shovel spawned at least 50 feet above him, just hanging in the air. Odd. But despite the few oddities, everything just works. None of the bugs got in the way of enjoying the game in the slightest. And what you might’ve noticed there is I didn’t mention framerate once. That’s because I only noticed one, maybe two visible frame drops in my entire playtime, and they were both caused by a lot of effects happening on screen at once. I used magic attacks in one hand and a sword in the other for most of my playtime, so I saw lots of spells being thrown around, and only rarely did I see the framerate dip even slightly because of it. 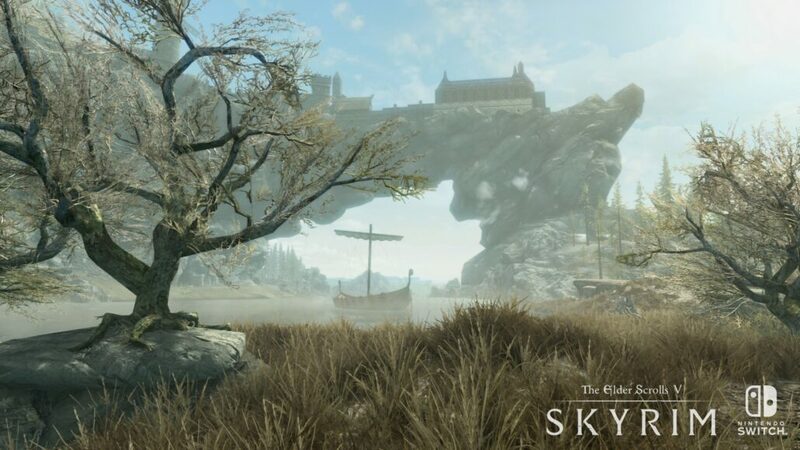 Skyrim on Switch runs very smoothly, in handheld or docked. On top of that, the resolution of Skyrim for Nintendo Switch is, surprisingly, very good. In fact, if I may hazard a guess, I would assume it runs in 720p in handheld mode with no AA, and 1080p in docked mode, with little AA if any. The resolution just appears to be incredibly crisp with little reason to complain whatsoever. 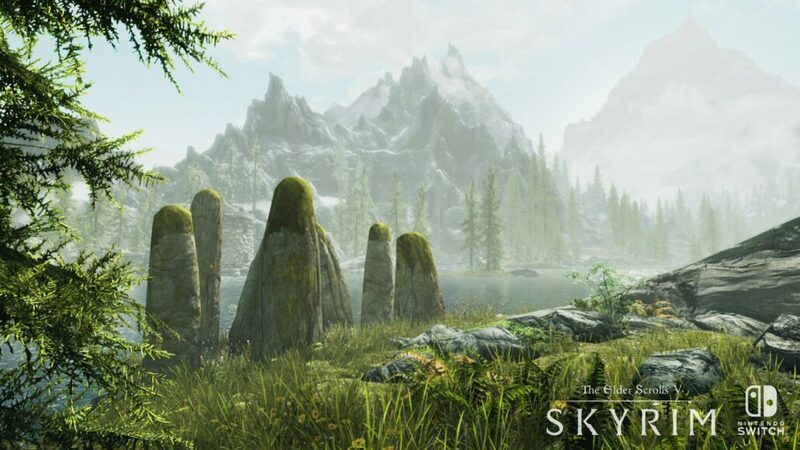 Truly impressive for the big world of Skyrim to run so smoothly and look so good doing it on the Switch. Sure this is an older game, and it’s not like draw distances have been massively pushed out, but they’re serviceable, perhaps even slightly better than the original Xbox 360 release. In handheld mode, you can certainly see grass and other things pop in as you move forward, and docked mode doesn’t push it out too much further, but unless you fixate on it, it’s not distracting. Textures are another aspect that is, surprisingly, just really good. Everything looks crisp, and only once when chasing a dragon did I see visible and obvious up-close texture pop in. The ground was just a brown smear until the dragon had settled on the ground and stopped running. And that was genuinely the only instance of obvious texture pop in I witnessed. 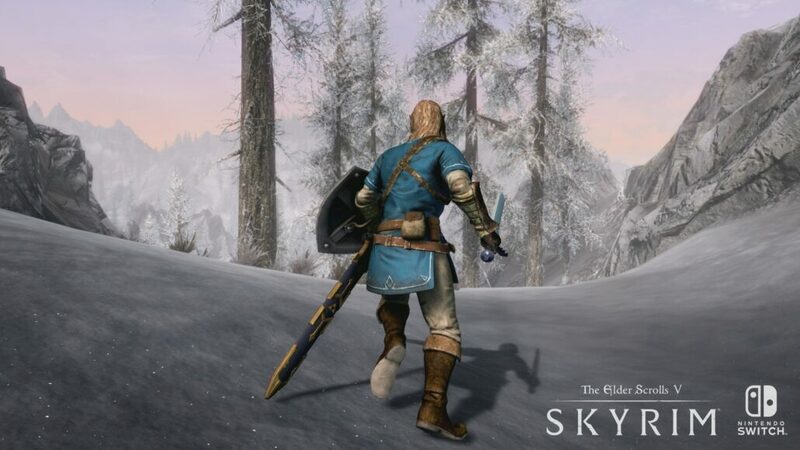 And there’s even an exclusive feature in Skyrim for Nintendo Switch. Lockpicking now uses HD Rumble, letting you feel your way through the lock to find a stronger vibration before unlocking. Thanks to this, some patience will have you unlocking Master locks on your first try, and I feel like what was previously a frustrating game of trial and error has been turned into a slightly skillful minigame, and it’s way more fun. Of course, in Skyrim for Nintendo Switch you also get all the DLCs (Hearthfire, Dawnguard and Dragonborn) which give you advanced house building options, a vampire storyline and a large, brand new island to explore. There’s loads of content in the base game alone, but these fully-featured campaigns are a nice addition since the campaigns definitely have the most interesting quests in them.